Here at Filthy Dreams, we take FAKE NEWS(!) seriously. That’s why we, like President Loony…I mean, Trump, are launching our first annual Filthy Dreams Mainstream Media Accountability Survey. We’re holding them accountable!! For…something!! Now, you might notice that our survey isn’t quite as long-winded as the GOP’s. I mean, who has time for that?! I’ve got things to attend to like trolling our president on Twitter. It took me at least two minutes to answer “Fake news” for every question. That’s just unacceptable (where was the poll for that…huh?!). So we’ve cut it down a bit, but left the main points intact. You, faithful Filthy Dreams readers, can help us stick it to the man or the press or whoever this is for exactly. We do it because we’re patriots!! Huzzah! 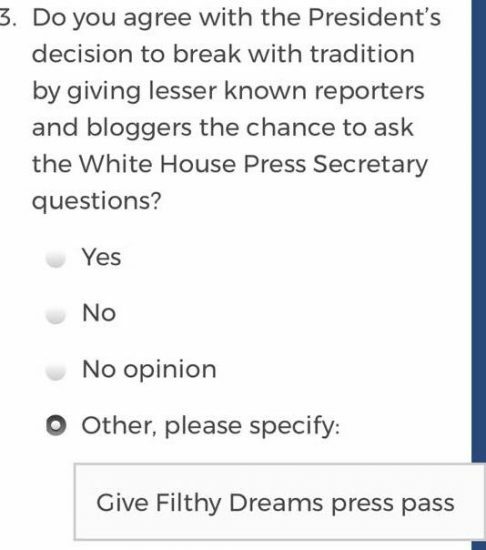 Tags: FAKE NEWS, Filthy Dreams mainstream media accountability survey, politics. Bookmark the permalink.